Just weeks before my husband Jim’s death, he told me I could finally leave work to be a homemaker. That had been my plan from the first day I went to work as a nurse. I hadn’t planned on my husband dying. He picked a fine time to leave me: Two kids in college. Our home renovation barely past demolition. Seriously, Lord? Contrary to many people’s assumptions, life insurance did not leave me a wealthy and well-cared-for woman. Instead of transitioning home, I would need to work for many years to come. When Jim and I married, he asked me to make one more promise in addition to our wedding vows: Should he die prematurely, I must continue to live. I mustn’t crumble into a ball of self-pity and resentment. Doctors had diagnosed Jim with cancer in his teen years, and although he was considered medically cured, he lived in the understanding that his life was a vapor. It wasn’t a secret that I spent most of my nursing career praying and planning to leave it. Work was a means to an end. I couldn’t see what God was doing through my coworkers, patients, and 12-hour shifts that made my feet ache. My children’s tears when I dropped them off at daycare, the room mother sign-up sheets I let pass by, and the women’s Bible studies I could not attend—those were the things I saw. A calligraphy of 2 Corinthians 12:9 rests on my bedroom wall. “My grace is sufficient for you, for my power is made perfect in weakness.” It served as a reminder to get out of bed on the days I didn’t feel like it—which seemed to be every day. Still, I operated under the unconscious notion that I was living a second-best option. Returning to full-time work in my 50s was hard. She hung her head and started to walk away. I sighed. “Hold on. What did you need?” We walked into a patient’s room and battled a troublesome IV, held his hand, and laughed at his jokes. I looked up, blinked back tears, and smiled. From that day forward, I endeavored to find delight in my work even in the difficulty. I invested in younger nurses. I also began to see that some of the very rules I railed against actually made good sense. I stayed long enough to see many of my mistakes turn into object lessons and then hospital policy. I gave two self-deprecating presentations to our new nurses—one bluntly subtitled “What to do when you really, really screw up.” As I prepared for those talks, the pages of Scripture seamlessly found their way into my power points—everything from “As far as it depends upon you” (Rom. 12:18) to “All things work together for good” (Rom. 8:28). Tomorrow I drive to work one last time. We didn’t always get along. There were days I drove home in tears and said I’m not coming back tomorrow. Thank you for stopping an anaphylactic reaction that could have killed my son. Thank you for opening a clogged artery in my children’s grandfather before he had a massive heart attack. Thank you for wrapping your arms around me and calmly escorting my husband to eternity when complications from open heart surgery became too much. Thank you crying with me as we watched his heart quit beating. 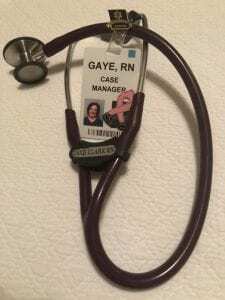 Looking back at the two-steps-forward-one-step-back process that was being a nurse at University Hospital, I’m very grateful I had the opportunity to grow up as a professional at this place. Some of the most resilient, brave, insightful, intelligent and, competent people work at University. I’m grateful to have had the privilege to work shoulder to shoulder with these heroes. So tomorrow I will leave University Hospital, and truly this time, I won’t be coming back. Funny, I always thought that moment would feel good. Awesome even. And yet, it has me in tears. Godspeed to all of you brave folks, my beloved University Hospital. There’s a lesson here that has taken me 30-plus years to learn: Work is not a call to meaning and significance so much as a call to die to self on behalf of others. Christ did this for us. Are we not to follow in his steps? Work is not a call to meaning and significance so much as a call to die to self on behalf of others. I am grateful the Lord never allowed me an opportunity to quit his assignment for me. He kept me where he willed, and that was University Hospital for almost 30 years. I can look back now and call it the “A plan.” The better-than-I-could-have-chosen-for-myself plan.